The Cubs organization recorded their first walkoff homer of the season. 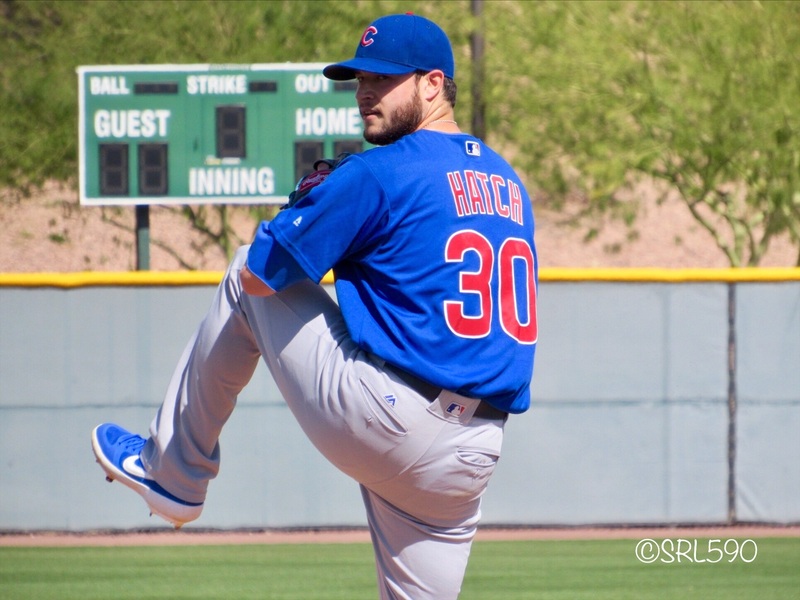 The starting pitching excellence on display in Chicago last night extended throughout the Cubs Minor League system as well. Unfortunately, the rotten injury luck appears to be as well. Duane Underwood, Jr. survived some spotty command and some bad luck in the 1sr inning, eventually settling in and delivering a strong outing. Trent Giambrone provided a big 3-run blast to give the Cubs a late lead. They were unable to put the game away in the top of the 9th as the Baby Cakes pushed across a run against James Norwood. The Cubs would not be denied the victory, however, as the red hot Dixon Machado delivered a walkoff solo homer in the bottom of the frame. Jen-Ho Tseng, a two-time Cubs Minor League Pitcher of the Year, was released yesterday. After rocketing through the system and becoming the youngest starting pitcher to make his debut since Sergio Mitre, Tseng encountered nothing trouble at the AAA and MLB level. Once he failed to make the Iowa rotation this season, the Cubs designated him for assignment to make room on the 40-man roster for Allen Webster earlier the week. Once he cleared waivers he still could have been assigned to Iowa, but the Cubs clearly felt more comfortable with the arms they already have in place, and those soon to be summoned from Tennessee, so chose instead to grant him his freedom to pursue his career elsewhere. Victor Caratini isn't the only young player dealing with a potentially broken hand interrupting a fast start, as Zack Short has also hit the IL after being struck by a pitch the other day. Early reports are he could be out a while. Short had been one of the top hitters down in Iowa the first week of the season. The final score gives no indication, but this game featured a second brilliant pitching performance from Thomas Hatch to open the 2019 season. He tossed 5 innings of no-hit ball, striking out 4 and allowing just 1 walk. Combined with his 5-inning shutout debut, he has now held the opposition scoreless over his first 10 innings while allowing just 3 base runners and striking out 11. The key to his early success has been command of all three of his pitches. He is keeping the ball on the edges or darting just off the plate with his secondaries without leaving many pitches in the middle of the zone. The Smokies carried a 1-0 lead into the bottom of the 8th before Jordan Minch got bombed for 5 runs, blowing the save. Bryan Hudson gave up a two-run shot in the 1st but then got dialed in from there, looking impressive over his final 4 innings of work. It has been an encouraging start for the still 21-year old lefty. He appears to be engaging his lower half more and just looks more fluid throughout his delivery. It has led to improved control and consistency with his stuff. His cutter and curve were both sharp in the outing and this is now his second straight start where he has missed some bats instead of completely relying on inducing ground balls.. It has been a slow start for Aramis Ademan, but the young SS appears to have added a little size and strength in his upper body. He struck the ball with authority in a couple of his plate appearances, including a two-run homer, his first of the season. Hopefully this game will get him going. It wasn't as pretty as Thomas Hatch's performance, as he did walk 4 batters and give up 1 hit, but Cam Sanders did match the 5 zeroes he hung on the scoreboard. What Sanders did well was keep the ball on the ground, recording 10 outs on the infield against just one in the air. Too bad about Short (& Lester & Caratini), but go Dixon!! He keeps this up for much longer and I'll have to do a comparison between video from last year to this year and see if I can find what he is doing different. I seem to recall Theo and others commenting that maybe they're being too careful and cautious and slow in developing and promoting their pitching prospects. Hatch is a perfect example of that. He was a stud leading the Sooners to the his last year of college world series in 2016 and being named Big 12 pitcher of the year. We draft him in 2016. He did well in AA last year and here he is again at AA dominating. He's 24 years old. Let's move him along already. They actually have been aggressive with Hatch. They jumped him directly to High-A his first professional season, he pitched in AA his second year. While his numbers were okay, and he did improve his stamina, none of his pitches or control took a step forward during 2018. Returning him to AA in 2019 was not unreasonable, especially in light of a relatively crowded AAA rotation (Mills and Alzolay back soon). He was competing in ST with Swarmer, Rucker and Thompson for an rotation Iowa rotation spot and Swarmer beat him. Simple as that. Rather than promote Hatch to AAA as rotation filler and then see him get squeezed out when other return from injury, they are slow playing a bit as a way to preserve depth. Don't worry, Hatch won't stay more than half the season in AA and likely no more than a month if he continues to pitch like this. I read about Tseng getting released last night. He ran out of time & room. Guys are starting to catch them. I am still a fan of Underwood. If this was the 1st year of the rebuild, I could see an Underwood & types like him getting a shot vs all of the waiver wire claims they went thru those 1st couple years. I don’t remember their names & really don’t want to research all of those duds again.... I also would like to see Clifton take it up a notch. I m still a fan of his. Maybe that lights a spark under some of these guys. Hatch looks really good so far, so he might see what’s going on. Swarmed & Robinson going ahead of him to AAA. Definitely. If we were still in the rebuild, guys like Underwood, Mills, Maples, Norwood would all have gotten a larger shot by now. They just have to keep working, and most importantly stay as consistent as possible. That, as much as anything will earn them a shot. On their best days any guy from AAA is capable of being a MLB player. The key is still finding a way to contribute during your "off" days while limiting the amount of times you would cost your team a win with a bad performance. This is the first I've heard about Dixon Machado. When and how did the Cubs acquire him ?